I would get back down. Fantastic (again) Cathee! Those eyes get me every time! Awesome capture and quote, fav! Beautiful lighting on her face! She is so pretty! Fav! 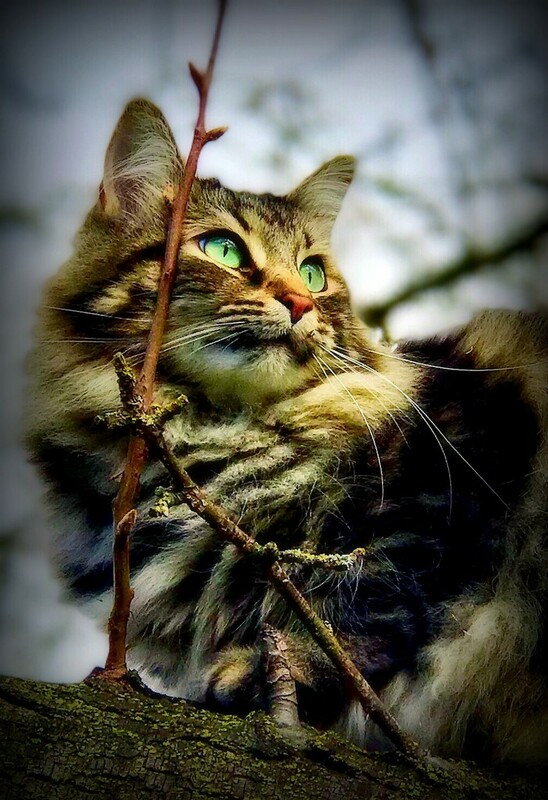 A lovely kitty portrait -- beautifully lit and you have captured the mood so well - A gorgeous model !! wow what lovely eyes...i would love a cuddle but would end up sneezing and getting puffy! Ooooooh, Katniss! Good morning to you, most beautiful kitty in the world. How nice to see you up that tree! Beautiful. You photograph her so well. Just asking for favs. Yes! She is gorgeous, lovely green eyes and a pink nose. @gardenfolk haha I pet all the cats I find...never learn! Lovely. Those eyes really shine out. Wow! Hello up there, gorgeous Katniss! This cat is so photogenic! Love! Fav! Big Fav! the lighting is incredible! So sweet. You're lucky she goes outside and you have lots of places to take pics of her. She is such a beauty! Great choice of focus!